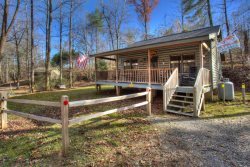 Edelweiss Chalet is the perfect cabin rental in Helen, GA located in Innsbruck Golf Resort. Edelweiss Chalet is perfect for one couple and up to three couples to share. It’s also great for a family of six! Beautifully decorated, featuring an upscale interior with granite countertops, stainless steel appliances, hardwood floors and gas log fireplace with flat screen TV in the main living area. Walls of windows bring the outdoors in, with beautiful creek views, and seasonal views of the 18th Fairway. The Queen and Twin bedrooms are conveniently located on the main floor, with a full bath in the hallway. No stairs required for that quick midnight snack! The Master bedroom on the upper level features French Doors that step out to balcony deck, and an adjoining full private bath. Step out from the Master to the upper loft area which overlooks the main level, and the same great views. Multiple decks at Edelweiss Chalet offer great areas for entertaining or relaxing and enjoying the terrific seasonal views. The lower level deck features a beautiful outdoor covered seating area -- a great spot to gather and relax in any weather! This Edelweiss Chalet vacation cabin rental is incredible. Located on the 18th fairway in the Championship Innsbruck Golf Resort in Helen, GA. Innsbruck is more like being in a national park than a resort, and truly offers the best of both. Guests of Edelweiss Chalet also enjoy complimentary use of the Guest Pool and Tennis Courts located just past the Security Entry of Innsbruck, on the left. Accessibility: Paved roads and driveway, accommodates 2 small vehicles, motorcycle friendly! • Visit Innsbruck Golf Course on our Local Area Guide for more information! Enjoyed our time at this beautiful cabin Will definitely use this service again!!! Very pleasant and comfortable. 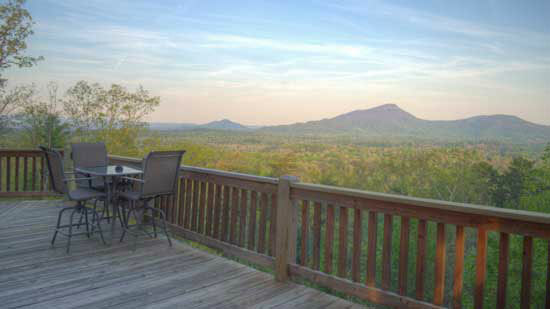 This was our third time to stay in a cabin in Helen but this was the first Pinnacle cabin that we have stayed in. It was definitely the nicest and cleanest cabin of all. Thanks so much! The process was so easy from start to finish with the staff helping every step of the way. The cabin was beautiful and lived up to all expectations. The property surrounding the cabin was breathtaking, which made for a fantastic experience. We loved our stay here. It was beautiful and and had a wonderful view. It was so quiet. Just what we needed for a special and romantic weekend. I have several friends already asking for information about our stay and I will definitely be recommending you guys.